Though Guizhou is said to be one of the most impoverished provinces in China, it has vast wealth in natural wonders and biological species. Home to Asia’s largest waterfall as well as 5 species of vertebrate found only in Guizhou, this is the unbeaten-path’s prime destination. Our itinerary features the Huangguoshu Falls, the largest waterfall in Asia, service projects with a minority school, traditional Miao-style paper & batik classes, hikes, tea-picking, cooking locally, as well as a chilling visit to a former Chinese concentration camp. Our school trips are completely customizable and can be tailored to meet your requirements. You can combine this itinerary with other destinations such as Chengdu, Yunnan, or Chongqing as an extension, or focus on a different subject such as Biology, Geography, Anthropology, Art or Music. Speak to a specialist now for more information. 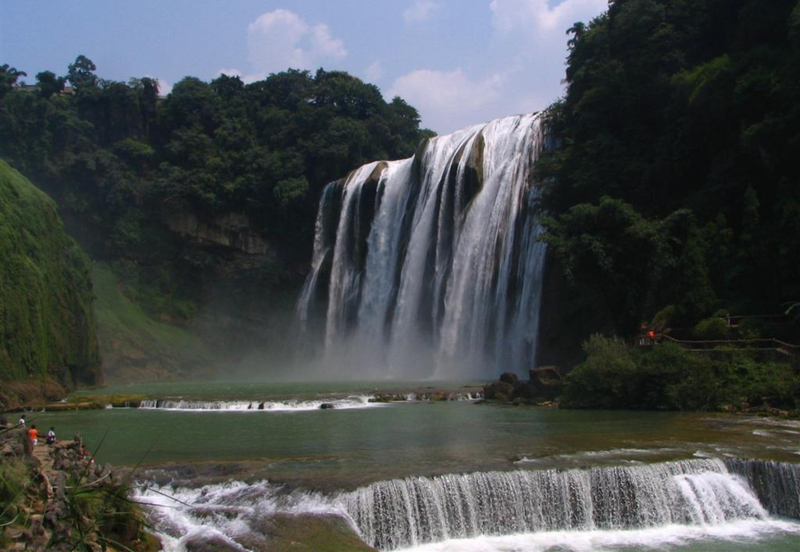 Arrive at Guiyang International Airport and transfer to the Huangguoshu waterfall site – the largest waterfall in all of Asia. Students go on a relaxing hike within the national park area (optional: sketch the surrounding scenery). Next, we go to the service site located in Huishui – one of the least economically developed prefectures in Guizhou. We talk a little bit about the accommodation that we will be staying in before we check in, it is a model hotel run by college students and staff in the tourism department. Start the day with a tour of the campus we are staying at and a brief history of their social enterprise mission. (College facilities such as football field, gym, basketball court, will be open to use by our students during their stay there). Prior to starting our service project, we will be doing a short cultural crafts activity native to the Miao people of the area; tie-dye. Next, it’s off to start our service project by first surveying the primary school that we aim to aid. After taking the appropriate measurements, we will begin building the furniture (usually bookshelves). Students should expect to be doing a minimum of 4 hours a day of work. Tasks typically involve measuring, sawing, sanding, nailing, painting, varnishing and decorating the project. In the evening, we relax with a short tea ceremony before retiring for the day. After a simple breakfast at the campus canteen, students will continue with their service project. After a morning of hard work, we get out of the workshop and visit the pristine tea fields that Guizhou is famous for. Afterwards, we will be meeting and interacting with students from the Bright Angels Music Program. These students have been recruited to the college’s visually impaired learning program. They are some of the best natural musicians in China and they come from the farthest reaches of the country to enter this program (Optional: Play some music together). We start the morning with a short hike around the beautiful surroundings. We encourage students to participate in some environmental service by collecting any garbage that we see along the way. Next, we head back to the workshop to finish the service project. The last step before donating the furniture we’ve built to the school is to decorate it together with the students at the school. Students may choose to paint motifs, alphabets, maps etc… At the end of the school day we accompany the students on their walks home for an exclusive look into nearby village life. We celebrate the week with a local farewell banquet of the local style Hot Pot. Finally, we have a reflection session together to discuss the thoughts and emotions experienced throughout the service week. We say goodbye to our guides and trip leaders and transfer to the airport to apply what we’ve learned back at home. If flight time permits, visit the Xifeng concentration camp which served as a secret prison during the cultural revolution. Creativity & Service; our main service activity, designing and building furniture, lets students apply their creativity to meaningful service. Action; walking students home after school (equivalent to daily hikes), hiking surrounding mountains, and tea-picking, we aim for students to develop confidence, fun, and positive associations to exercise. Socio-historical knowledge; students will be exposed to a range of different social and historical facets of the Guizhou region. Visiting its top landmark (Huangguoshu Falls), interacting with her indigenous peoples, as well as seeing the darker sides of her history (Xifeng concentration camp), students are sure to walk away with a broad yet deep understanding about this little-known part of China.